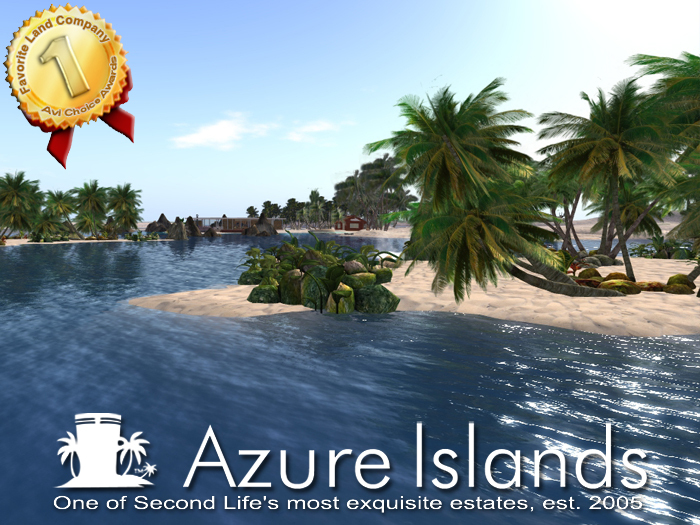 Settle down on the Azure Islands, one of Second Life's most exquisite estates, est. 2005. The Azure Islands offers some of the most well-developed and terraformed land in Second Life. Various selections of land sizes to choose from, all tailored to fit everyone’s budgets and needs. Our main continent has been operating since May 2005, and our presence in Second Life has been operating even longer. We operate over 20 million square meters of land in Second Life and have full-time paid support teams operating over most time zones. Our holdings have expanded over time to include several other large estates such as the Nova Islands. We've strongly believed when we've designed the Azure Islands continent that consistency and scale is a key to building good looking areas. We back this up with a 'light touch' zoning policy to keep things looking good. Each of the sims placed onto the Azure Islands continent has been designed by expert artisans and fits into our master design plan. The Azure Islands are competitively priced, no set up fee and no premium account needed. In fact for the majority of our parcels, we're cheaper than the full cost from Linden Lab for a similar parcel on the mainland (sometimes by up to 40%).